As you practice, Pianonome listens and gives constant feedback just like a teacher. The engaging drills support students, while building essential skills, promoting musical independence from the earliest levels. Stay motivated as you watch your skills improve over time. Challenge yourself with increasingly difficult pieces and watch yourself improve with practice. An introductory practice book is included with the app for free. Our quality teaching library is constantly growing. There are no subscriptions and each book is yours to keep and use forever. The included visual and audible metronome with high precision helps you hone your rhythm and timing skills. You can mute the audible metronome and accent the first beat in the settings. 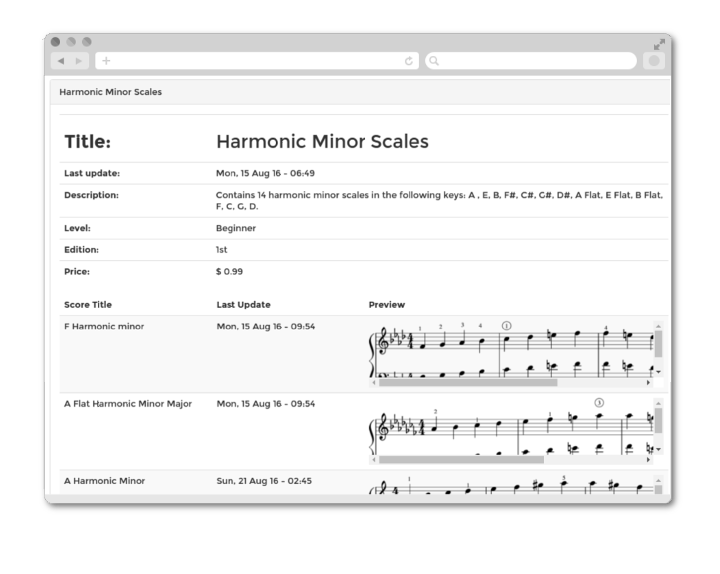 Publish your own music in the Pianonome platform, entirely for free. Enrich the Pianonome community with your compositions and arrangements. Set your own prices and keep a generous profit-share. Compose with your favorite notation software. Upload your scores for automatic conversion to the Pianonome teaching platform. Distribute your scores to the Pianonome community, or your own use. Contributors receive anonymous student data. Track your score downloads, student practice frequency, student progress, and more! Use real data from a range of users to assess your teaching method. Create a free account on this page and introduce yourself. We will get back to you as soon as we can, and will be available to help prepare and publish your books. You will remain the copyright holder of your own books! ©Copyright 2017 - Lilac Atassi. All rights reserved.